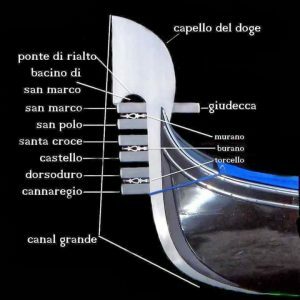 The Iron of the Bow (in Venetian “fero da próva” or “dolfin”) is the metal part that stands in front of the gondolas. It has a meaning that very few people know about. It is mistakenly said to have the purpose of protecting the bow from possible collisions and embellishment. In reality, the Iron of the bow has an essential and very precise function: being very heavy, it weighs down the bow of the boat and keeps it always in trim with any number of passengers. The Iron embodies the essence of Venice. The large “S” Metallica, which makes up almost all of it, symbolises the Grand Canal, whose shape it recalls. The upper part symbolizes the Doge’s hat. A small crescent recalls the silhouette of the high bridge and the plane of the San Marco basin. The six rectangles on the outside symbolize the six districts of Venice, while the inner one recalls the Giudecca. The three metal cuts inside the spaces left by the above mentioned rectangles symbolize the three most important islands of the Venetian lagoon: Murano, Burano and Torcello. Like the tradition of the Christmas tree, this too has pagan origins. The Druids, priests of the Celts, attributed great power to mistletoe because it is an aerial plant, that is, one that lives attached to the trunk of trees without touching the ground. For this reason, the Celts considered it a symbol of the gods living in heaven: if it had touched the earth with its roots, like other plants, it would have lost its divine powers. In addition, mistletoe can have healing effects, and in some cases it can also be poisonous. The Druids collected it only when necessary, using a golden sickle and wearing white clothes, barefoot and fasting (Panoramix, the druid of the comics of Asterix, did so!). The legend linked to mistletoe is very beautiful. The protagonist is the goddess Freya, protector of lovers, and her two sons Balder and Loki. The first one is good and for this reason much loved by all and the second one is irascible, envious and consequently feared. Loki, out of jealousy, intends to kill his brother but his mother Freya, of course, tries to protect him in every way. She then asks for help from the natural agents: Air, Earth, Water, Fire, plants and animals. But he forgets to ask for the help of mistletoe, a particular plant that lives neither under nor above the earth. Of course, Loki used the woven mistletoe to make a sharp weapon with which to kill his brother. The whole natural world mourned Balder’s death, including Freya. His tears fell on the mistletoe dart and turned into berries that magically gave life back to his son. From that day on Freya kissed as a sign of thanksgiving all those who passed under the mistletoe plant promising peace and love. On the 29th of March 1516, the Senate of the Republic passed a law that had no precedent in the history of the city; the new law allowed Jews to reside in Venice as permanent residents. However there were restrictions. The Jews were only allowed to live in a segregated area. Before the Jews settled there the Venetians called this area the ‘getto’ (in reference to the word for foundry in Venetian) because it had been a place where foundries for the construction of cannons for Venetian ships were located. It is believed that the first Jews from Northern Europe and of Ashkenazi origin coined the term ‘ghetto’ because they pronounced ‘getto’ with a strong ‘h’. Thus the first ghetto in history was formed. In Venice, a city of commerce, it was necessary to be able to borrow money. Initially the Christians of the Monti di Carità carried out this activity, but soon the loaning of money was considered contrary to the Christian dictates and thus the Monti di Carità was closed. And it is for this reason that the Republic officially allowed the Jews to do the necessary job of lending money. However history tells us that the Jews were, in fact, already money lenders in the fourteenth century. So the Venetian Republic legislated an activity that was already in practice. The new law established that the loaning of money would be allowed with taxes and rates fixed by the Republic. This money lending activity was carried out above or around three pawnshops in the Campo del Ghetto. These three stalls, which survived until the end of the republic in 1797, were identified by red, green and black signs. 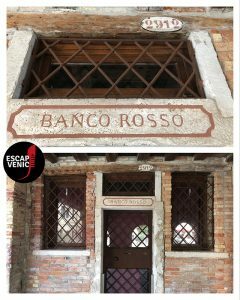 Until recently, it was possible to visit the restored Banco Rosso. However, it is now closed to the public. The Banco Rosso is considered to be one of the first Jewish pawnshops in the world. The name of the bank comes from the red receipt that customers received when they left an object at the shop in exchange for some money. It is thought that the banking term ‘in the red’ comes from this ancient Venetian pawnshop. The theme of our Venice escape room is the famous comedy ‘The Merchant of Venice’ by William Shakespeare. In this story, the Jews are seen as usurers full of money and greed. In reality, they were usurers because the Church and the laws of the countries in which the Jews resided attributed this trade only to them. Sources: “Maybe Not Everyone Knows That… in Venice” by Alberto Toso Fei. Do you know why, even today, Venetians built floating votive bridges (and still they do) for the most important festivals? The answer is simple. Apart from the Rialto bridge in the Grand Canal, there were no fixed bridges! The tradition began because only one bridge – that of Rialto – served the Canal. It was a hinge for the entire structure of the city and most of the movements were by boat. Even today there are only four bridges over the Grand Canal (including the last one in 2008, the controversial Ponte della Costituzione). This fact contributes to keeping the tradition alive. In 1631 the Serenissima had to thank the Madonna for saving the city from the plague and it was certainly not possible to ferry the whole city along the Grand Canal to reach the new Votive Temple of the “Madonna della Salute”. Then Venetians built a bridge with floating boats. The government decided to repeat every year, as a sign of thanks, the procession in honor of the Madonna called since then “Health”. The Feast of the Madonna della Salute, still very much felt by the Venetians, is on 21th November. 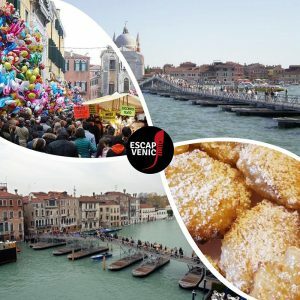 But did the Votive Bridge of the Madonna della Salute or the Redentore Festival in the Giudecca Canal (which is on the third Sunday in July) come first? It’s Halloween time so we looked for a Venetian legend about witches to tell you. Of the many, we particularly like one because it’s about Tintoretto, whose 500th anniversary is celebrated in 2018! So we elected this legend as the Venetian Halloween legend for 2018! We left it practically the same as the source, so beautiful it is. From: “Alberto Toso Fei: Tintoretto and the witch, in a dark legend the black magic appears in Venice”. Enjoy reading! The time came for Marietta, the eldest daughter of the painter Jacopo Tintoretto, to take her first communion. 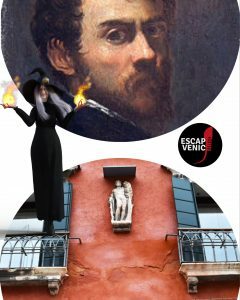 As you know, Tintoretto’s house at 3399 of Fondamenta dei Mori was close to the convent of Madonna dell’Orto (and to one of the statues of the Rioba brothers, see also photos in https://www.escapevenice.it/it/2018/09/04/la-casa-del-cammello/). The children went to the convent for ten days before communion to receive the Eucharist. So it was that on the first morning Marietta met an old woman who asked her where she was going. “To make communion,” she replied. “Say, do you want to be like Our Lady?”, pressed the woman. “Oh, but that’s impossible,” replied the little one. “No, if you do as I say. Instead of taking communion, keep the particle in your mouth. Then hide it at home in a safe place. When you have ten, I’ll come back, and you’ll see what a nice surprise. For a few days the child did as the woman had told her. For fear of someone finding the particles, she hid them in a box in the garden of her house. The hiding place was near the small shelter where the father, as was the custom at the time, kept a pair of pigs and a donkey. Five or six wafers, one morning the beasts knelt in front of the drinking trough. They didn’t want to get up, not even with a stick. So it was that the child confessed in tears. Tintoretto, for the work he did – though a man of faith – was aware of some practices related to the Kabbalah and magic. He knew well that with that method the old witches “recruited” more young people by deception. He decided not to speak of it with anyone. On the morning of the tenth day, the painter instructed her daughter. When she returned home she would let the old woman up. The witch did not delay, and Marietta went to open them. But she did not have time to cross the threshold of the hall on the upper floor that the artist had already attacked her with a knotty stick. After the first woods, the woman was happy to turn into a cat. In this form she began to run and climb along the walls, on the furniture, on the curtains. At the end, having seen itself lost, she launched a very sharp cry. The witch wrapped in a black cloud hurled herself so violently against the wall that she came out of it leaving a hole in the wall. No one ever saw it again. But Tintoretto, so that she could not in any way return from where she had fled, had a relief of Hercules with a club walled to guard the walls of the house, where it is still visible today. In these days we are all outraged by the scarring made to the Lion of St. Mark. The Lion is the symbol of Venice. So even if the damage it seems of slight entity and solvable, for us Venetians it has been an attack to our traditions, to our memories as children and an offense to our flag of the Serenissima. Hence the strong popular outrage: do not touch us the Lion of St. Mark! 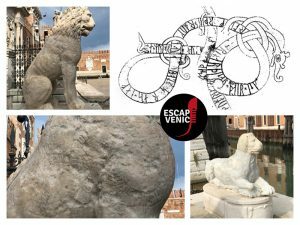 The Lion of St. Mark: legend and symbol of Venice… but why the Lion? The symbol of the Lion of St. Mark comes from an ancient legend, according to which the Evangelist Mark during his journey from Aquileia to Rome, having been surprised by a storm, had found shelter in a small island of the lagoon. Here an Angel appeared and said to him: “Pax tibi Marce, evangelista meus, hic requiescat corpus tuum” (Peace to you Mark, my Evangelist, rest your body here). It was a prophecy! Many years later Venice will in fact be the place of rest after his death. Then St. Mark continued his journey and finally he seems to have died in Alexandria, Egypt. Since ancient times, the Coptic community of Alexandria claimed to keep the relics of the Saint; this had not left indifferent the Doges, in Venice, who aimed to have in the city even one of the four evangelists, would give much power to the city!… and the prophecy of the Angel came true: in 828 A.D. two merchants from Venice stole the Saint’s remains and transported them to Venice. On board there were: a Greek monk (Staracius) and two Venetian tribunes (Rustico da Torcello and Bono da Malamocco). They managed to pass the customs control hiding the relics under a load of vegetables and pork, which the Muslims refused to control because they were considered impure. Once in Venice, the relics were hidden in the Basilica, where they were found only in 1094, on 25 June. St. Mark became the symbol and Patron Saint of the city, and the Basilica assumed great value as the guardian of the remains of one of the four Evangelists. c) It is said that the Angel who appeared to St. Mark was in the form of a winged Lion. Therefore, the reason for the choice of the Lion symbol is not certain. Perhaps a little all the reasons above. 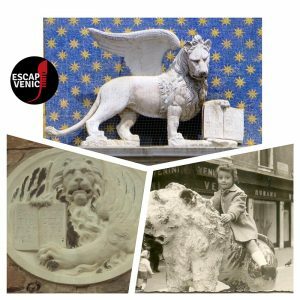 The fact is, that the winged Lion took on a political meaning for Venice in addition to the religious one: the Lion symbolizes the strength of the Saint’s word, the wings the spiritual elevation and the halo indicates his holiness. Not only that, it is a symbol that expresses the heraldic meaning of majesty and power, and the book is a symbol of wisdom and peace (in the open book you can read the words of the prophecy of the Angel to St. Mark), the sword instead, symbolizes justice. All characteristics that the Most Serene Republic felt as its own. The image of the Lion can be represented in different positions among which the best known are the Andante and the Moléca. – Andante, that is when the body of the Lion is seen in full, in profile, and the right front leg rests on the book and the snout forward. The wings, usually parallel, may have the feathers well distinct or compact, the tail, more frequently at rest but also raised. It was thought that the raised tail indicated a military victory, but it is not historically confirmed. In some paintings two legs rest on the ground and two on the sea, indicating the possessions of the Venetian Republic. This representation was used in the banners and statues, where the space for the representation was abundant. – Molèca, that is when the Lion is represented frontally and squatted, almost assuming the shape of a crab. In Venetian, in fact, the word moèca indicates the crab. According to some, not only did the shape remember it, but also the fact that in some representations the lion came out of the water, just like a crab. The circular shape was ideal to be inserted in coats of arms and round reliefs. Finally, a curiosity: Lions have always fascinated Venetians and, in addition to filling the city with marble symbols (see Legend of Arsenal Lions), also many living Lons were kept in patrician gardens. It seems that around 1300 a Lioness even gave birth at the Doge’s Palace. 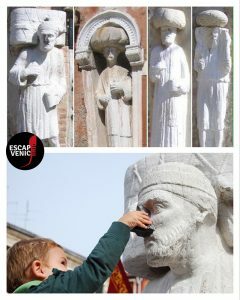 San Marco is celebrated on April 25th, the day of his martyrdom in Alexandria of Egypt… and for us Venetians it is the Feast of the Bòcolo. “La matina una messeta, dopo pranzo una basseta e la sera una doneta” (in the morning a mass, after lunch a game and in the evening a woman) said one of the most popular Venetian proverbs of the 18th century. Venice of the Serenissima was the capital of world trade, comparable to today’s Wall Street (as we have already written in a post) but also of the game and comparable to Las Vegas that we know today. It was a volcanic city, incredible, in continuous ferment. There is a curious episode between history and legend that dates back as far as 1172 the first public gaming house, or rather gaming square. The Venetians, after yet another clash in the East, returned to the Lagoon with three columns as spoils of war. One of them ended up in the water and was never found again. The other two remained in Piazza San Marco for a long time because no one could lift them vertically. An edict was issued and finally a certain Niccolò Barattieri, architect and engineer, managed to lift them: still today they support the winged lion of the Evangelist and San Teodoro. In exchange Barattieri obtained from the Doge Sebastiano Ziani to be able to organize any game in the space between the two columns and on their steps. A few years later the first repressive laws were issued: the corporal and pecuniary punishments provided for were terrible (sedan, lashes, cutting of the nose or ears …), but nothing managed to defeat in the nobles and in the people the desire to risk their money with dice, cards or lotteries. A real gambling fever. But what was the game about? At a bit of everything, the important thing was to play and bet. As indicated in Pier Alvie Zorzi’s latest book “From San Marco to Sant’Elena, il cuore del mondo” in 1254 the game in the atrium of San Marco was forbidden, and this makes you understand how much the game had taken the Venetians who even played at the church entrance and a few years later also inside the church! In 1292 they tried to forbid it everywhere (only chess and board games were allowed)! They all risked their money: nobles, priests, monks, Jews, vagrants, criminals and strangers. So the Serenissima decided to open a public casino, managed directly by the government with strict rules, even set by the Council of Ten. It was the first authorized casino in the world: it was the Ridotto Grande, in Calle Vallaresso, where today stands the Hotel Monaco. 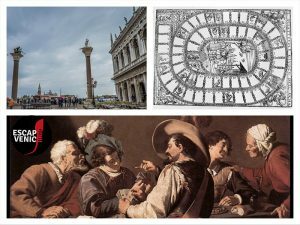 The croupiers were nobles who had fallen into disrepair; one could only enter and play with one’s face in disguise; the house was opened at Carnival, which in any case lasted almost six months in Venice (from October onwards). Inside the Casino, in addition to the game, you could find “company” but also discuss, read poetry, play or listen to an instrument. The greatest development of gambling was in the seventeenth and eighteenth centuries, so much so that in the mid-eighteenth century in Venice there were 118 Casinos. And the tradition has not been set aside, since 1938 Venice is the only Italian city to have a Casino managed by ‘municipal administration. 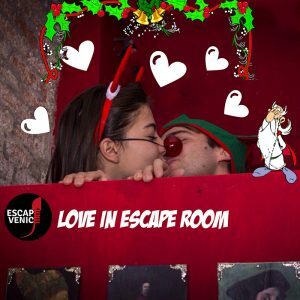 It’s an honor for us to have the artist as Author of the Soundtrack of our Escape Room, the “Merchant of Venice”. 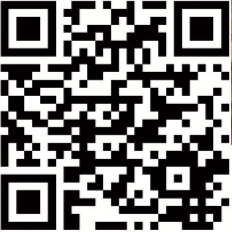 If you want to listen to the Soundtrack, you can use the QR code and enter the atmosphere of Shylock’s room. Enjoy listening! In Campo dei Mori 3381 (fondamenta Gasparo Contarini, sestiere di Cannareggio) there is a unique building, Palazzo Mastelli, which has a high relief of a camel on its façade. Well, don’t you think it’s strange to have a camel in Venice with a cameleer? Campo dei Mori is one of the most fascinating, mysterious and little known parts of the city, away from the hordes of tourists. The Palace was owned by three brothers Rioba, Sandi and Afani, who came from Morea in the Peloponnese from here the “Moors” then called Mastelli and traded spices and silks. It is fairy-tale that the name Mastelli derives from a colourful image of their wealth: from the “tubs”, “mastei” full of gold and silver coins that they possessed. The statues of the 3 brothers and a servant are in Campo dei Mori. The statue with the suitcase on its shoulders is Rioba and the suitcase is perhaps a sign of the wealth that the brothers brought to Venice. The other two brothers have turbans. 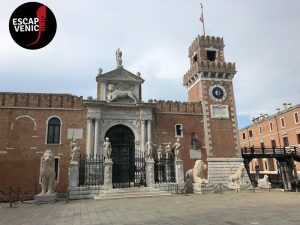 The building is very fascinating because it contains many architectural contaminations of cultures that have passed through Venice and have brought and left pieces of their history and art (and we like the contaminations because they bring cultural richness). The palace dates back to the 12th century (probably 1112 A.D.): the upper floor retains mature Gothic forms in the window and corner balcony typical of Venice; the triphor on the first floor is not Gothic and the balcony is Renaissance; part of a Roman altar is the column in the window at the left corner of the first floor; the cornice at the base of the building, in Istrian stone and pink brocatelle from Verona, is adorned with reliefs of leaves and flowers of the Byzantine type and always on the ground floor round arches certainly not Byzantine. And another curiosity (oriental) of the building is the small fountain in Arabic style, located at the base on the right side of the facade, which, until a few years ago, was working. The gondoliers used it to quench their thirst and those who passed over the river with their boats. Could a palace not have legends? 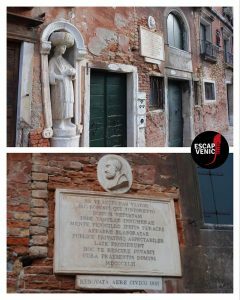 Right in Venice where legends and myths are part of the stones of the city? Impossible. In fact, there are two legends. The most romantic and least known first… who knows if true. 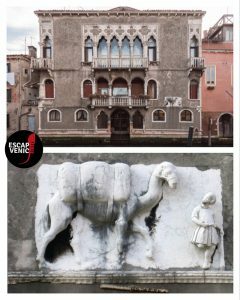 Legend has it that a rich oriental merchant, having to leave his homeland for Venice (just one of the Mastelli brothers), had a camel and camele maker sculpted on the façade of his new Venetian residence to make it easily recognizable to his beloved, who had not accepted his proposal to marry him: “I therefore leave with a torn heart and try to forget you, but if one day you want to reach me in Venice, you just have to ask where the camel house is located“. Apparently the promise brid never appeared before the rich merchant’s house. It is not known if she was lost in the Venetian streets or if she found a beautiful man in his homeland. The second legend is better known and is “The Legend of Rioba” of which I have heard various versions narrated, typical of oral tradition, and I tell you what I like the most. The three brothers Rioba, Sandi and Afani (those of the statues in the image) were skilled merchants but also scammers and did not refrain from deceiving potential customers for money. According to legend, one day a merchant’s widow went to the three brothers to buy fabrics from them, which were used to continue the work of her husband. The three merchants were looking forward to deceiving such a naive lady, regardless of her misfortune. So they began to praise their very common cotton fabric as the most precious and sumptuous in Venice, justifying in this way its exorbitant price. It is said that the “Sior Rioba”, addressing the Lady, said “This is the best yarn of Venice, noblewoman, and that the Lord can change us into stone if we do not tell the truth!” At these words the woman, having paid the exorbitant sum requested, before leaving, said: “And I thank you messengers! And so that the Lord may have in your regard the same care and attention that you have had for me“. The widow was very religious and she prayed to Saint Mary Magdalene to throw her curse on the three merchants and for incredible miracle the brothers became three stone statues, which were placed in a niche of Campo dei Mori as a warning to those who saw them. It is also said that during particularly cold nights the spirit of Sior Rioba trapped in the statue weeps and that the beats of his heart can be felt by those who pure of spirit will lay a hand in his chest. If you are pure in spirit and if you go on a winter night in the camp of the Moors…try it and maybe you will hear the cries of Rioba. Despite all the legends, the Mastelli family has really existed. In 1202 the family took part in the Fourth Crusade, which was desired and conducted by Doge Enrico Dandolo. Later they opened a fondaco where they traded spices “All’Insegna del Cammello”, then they moved the seat and the business in the hinterland veneto where they died in 1620, when the last descendant, a certain Antonio Mastelli, died. Of the four statues, the most famous is that of Rioba, called “Sior Rioba” in Venetian dialect, on which it was customary in the following period to hang tickets and satirical inscriptions against the power of wealthy families during the period of maximum splendour of Venice. Two other statues, called “oracles” in Venice were used to hang satirical tickets: the statue of the Maroco de le pipone (Morocco of the Melons), a seller of melons (this statue is in Piazzetta San Marco), and the statue of the Gobo de Rialto, in San Giacometto. In 1800 the statue of “Sior Rioba” lost its nose this was replaced with a fairly improvised iron nose and since then it is said that touching his nose brings luck. In 1848 the Sior Rioba even gave its name to a satirical newspaper “L’ombra de Sior Antonio Rioba” newspaper that contributed to the spread of its popularity. In the night between April 30 and May 1, 2010 the Sior Rioba was beheaded and immediately mobilized law enforcement agencies and ordinary citizens. Luckily the head was found in Calle della Racchetta on May 3rd and the statue was promptly restored. At number 3399 of the foundations of the Moors instead there is the house of Tintoretto, right next to the statue of one of the brothers there is a plaque in memory of Tintoretto who lived here and another relief from the Roman era depicting Hercules. Tintoretto is buried in the nearby church of the Madonna dell’Orto. How much history in one place! The Venice Arsenal was a fundamental place for the life of the city. It was a real city in the city. It was the place that allowed Venice to dominate the seas militarily and commercially. At the military entrance to the Arsenal there are 4 lions (not one!) to symbolize the importance of the place. Such a place is rich in legends. One of them tells the story of the lions guarding the entrance. The biggest lions are spoils of war and come from Athens and carry engraved runic inscriptions. One of the two youngest came from Delos, in memory of Corfu’s victory in 1718. Legend is full of magic! The protagonists are a magician, a hero and lions… if you’re ready to listen, you’ll hear the story. Legend has it that in November 1719, after a storm that had lasted a couple of days, the horribly torn bodies of two sailors, one Greek and the other Maltese, were found right next to the Arsenal portal… they seemed to have been torn apart by a beast. The authorities tried to know if by any chance some beast had escaped from some menagerie, but nothing. People were afraid and they started talking about magic, the lions of the Arsenal, the place. The surveillance of the area was entrusted to the Navy (which still supervises the area) and Captain Enrico Giustinian. After about a week another stormy night, and a new body horribly torn apart, that of such Jacopo Zanchi, a sort of perdiday, unreliable person like his wife, prostitute for lost time. All the victims lived not far from the place where they were found, and this other event increased terror among the local residents. One day Captain Enrico Giustinian saw a scene in the street between Zanchi’s widow and an old merchant with a reputation for usurer, called Foscaro. The widow was insulting the usurer who sibilated to her “We’ll see where your boldness ends on the next stormy night”. On the next stormy night Captain Giustinian hid near the entrance to the Arsenal and waited to be guarded by his sword. The hours passed and finally, between midnight and one o’clock, always under the pouring rain and the wind, an arch of fire arrived from the nearby houses and literally materialized the old Foscaro near the greatest lions. He revolved around one of them, touching the runic inscription with his fingers and at the same time pronouncing its meaning in this mysterious language. At that moment a luminous globe was formed on the portal and a first lightning struck the seated lion that slowly took life, huge and fierce. Just at that moment Zanchi’s widow, accompanied by a friend, turned the corner of the shore and, while a second globe with a second lightning struck the other lion, the first was already fiercely resetting one of the two women. The old usurer watched the scene, impassively, continuing to pronounce mysterious words and touching the runes. Shaken by terror and magic sings, the Captain splashed the sword and struck the old man in his chest, just as a third lightning struck the third lion. With a frightening roar and blinding flash of lightning everything returned instantly as before: the lions in their place, motionless, the friend of the widow, mortar crumbled immersed in her blood. Of the old man remained only a heart of stone next to the sword that had fallen on the chews. The head of the third lion was still alive, and roaring and moving desperately anchored as it was to a body of stone, so the Giustinian beheaded him. The head did not fall down but exploded literally, spreading around a blackish substance. Subsequent investigations showed that the old man was a sorcerer and had been cheated by Zanchi, so he wanted to take revenge. The widow was locked up in the asylum, because she had gone mad, and the head of the third lion was replaced, as can still be seen today. Legend perhaps is linked to some element of truth in fact if you go to the arsenal observe the great lion on the left of the entrance, and look for the runes, they are still there. Then go and see the third lion, towards the canal… the head is of a different colour! True or not true this legend is still suggestive and the mystery is still imbued in this fantastic place, rich in ancient elements and perhaps (for those who believe) magical. This is Venice rich in mystery and magic in many corners of the city. His legends can see, touch and perhaps, closing their eyes, relive in a sort of journey through space and time!